PITTSBURGH, Aug. 9, 2018 – As marine mammals evolved to make water their primary habitat, they lost the ability to make a protein that defends humans and other land-dwelling mammals from the neurotoxic effects of a popular man-made pesticide, according to new research from the University of Pittsburgh School of Medicine. The implications of this discovery, announced today in Science, led researchers to call for monitoring our waterways to learn more about the impact of pesticides and agricultural run-off on marine mammals, such as dolphins, manatees, seals and whales. The research also may shed further light on the function of the gene encoding this protein in humans. "We need to determine if marine mammals are, indeed, at an elevated risk of serious neurological damage from these pesticides because they biologically lack the ability to break them down, or if they've somehow adapted to avoid such damage in an as-yet undiscovered way," said senior author Nathan L. Clark, Ph.D., associate professor in Pitt's Department of Computational and Systems Biology, and the Pittsburgh Center for Evolutionary Biology and Medicine. "Either way, this is the kind of serendipitous finding that results from curiosity-driven scientific research. It is helping us to understand what our genes are doing and the impact the environment can have on them." Clark and lead author Wynn K. Meyer, Ph.D., a postdoctoral associate in his laboratory, knew from previous research by other scientists that some genes behind smelling and tasting lost their function during the evolution of marine mammals. They set out to see what other genes conserved in land-dwelling mammals had lost function in marine mammals. By analyzing DNA sequences from five species of marine mammals and 53 species of terrestrial mammals, the team found that Paraoxonase 1 (PON1), was the gene that best matched the pattern of losing function in marine mammals while retaining function in all terrestrial mammals. PON1 even beat out several genes responsible for smell and taste, senses that marine mammals don't rely on much. In humans and other terrestrial mammals, PON1 reduces cellular damage caused by unstable oxygen atoms. It also protects us from organophosphates, some of which are pesticides that kill insects – which lack PON1 – by disrupting their neurological systems. Clark and Meyer worked with Joseph Gaspard, Ph.D., director of science and conservation at the Pittsburgh Zoo & PPG Aquarium, and Robert K. Bonde, Ph.D., now a scientist emeritus at the U.S. Geological Survey's Wetland and Aquatic Research Center, to obtain marine mammal blood samples from U.S. and international scientists and conservation biologists. Collaborators at the University of Washington reacted blood samples from several marine mammals with an organophosphate byproduct and observed what happened. The blood did not break down the organophosphate byproduct the way it does in land mammals, indicating that, unless a different biological mechanism is protecting the marine mammals, they would be susceptible to "organophosphate poisoning," a form of poisoning that results from the buildup of chemical signals in the body, especially the brain. In an attempt to learn why marine mammals lost PON1 function, the researchers traced back when the function was lost in three different groups of marine mammals. Whales and dolphins lost it soon after they split from their common ancestor with hippopotamuses 53 million years ago; manatees lost it after their split from their common ancestor with elephants 64 million years ago. But some seals likely lost PON1 function more recently, at most 21 million years ago and possibly in very recent times. "The big question is, why did they lose function at PON1 in the first place?" said Meyer. "It's hard to tell whether it was no longer necessary or whether it was preventing them from adapting to a marine environment. We know that ancient marine environments didn't have organophosphate pesticides, so we think the loss might instead be related to PON1's role in responding to the extreme oxidative stress generated by long periods of diving and rapid resurfacing. If we can figure out why these species don't have functional PON1, we might learn more about the function of PON1 in human health, while also uncovering potential clues to help protect marine mammals most at risk." 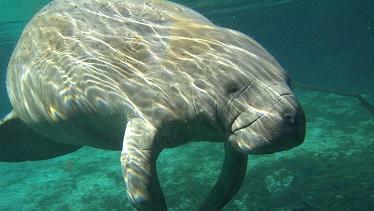 As an example of the potential real-world consequences of losing function at PON1, the researchers explain in their scientific manuscript that in Florida, "agricultural use of organophosphate pesticides is common and runoff can drain into manatee habitats. In Brevard County, where 70 percent of Atlantic Coast manatees are estimated to migrate or seasonally reside, agricultural lands frequently abut manatee protection zones and waterways." The scientists believe the next step is to launch a study that directly observes marine mammals during and shortly after periods of excess agricultural organophosphate run-off. Such a project would require increased monitoring of marine mammal habitats, as well as testing of tissues from deceased marine mammals for evidence of organophosphate exposure. The most recent estimate the research team could find of organophosphate levels in manatee habitats in Florida is a decade old, Clark said. "Marine mammals, such as manatees or bottlenose dolphins, are sentinel species – the canary in the coal mine," said Clark. "If you follow their health, it will tell you a lot about potential environmental issues that could eventually affect humans." Additional authors on this research include Jerrica Jamison, Raghavendran Partha, M.Tech., Amanda Kowalczyk, B.S., Charles Kronk, B.S., and Maria Chikina, Ph.D., all of Pitt; Rebecca Richter, B.S., Judit Marsillach, Ph.D., and Clement E. Furlong, Ph.D., all of the University of Washington; Stacy E. Woods, Ph.D., M.P.H., of Johns Hopkins University; Daniel E. Crocker, Ph.D., of Sonoma State University; and Janet M. Lanyon, Ph.D., of the University of Queensland. This study was supported by National Institutes of Health grants R01HG009299, U54 HG008540 and T32 EB009403. Collaborators were supported by funds from the Biotechnology Research Gift Fund, University of Washington, Division of Medical Genetics, and by grant 16SDG30300009 from the American Heart Association. Marine mammal samples were collected with funds from the Winifred Violet Scott Charitable Trust, the Sea World Research and Rescue Foundation, and the U.S. Geological Survey.